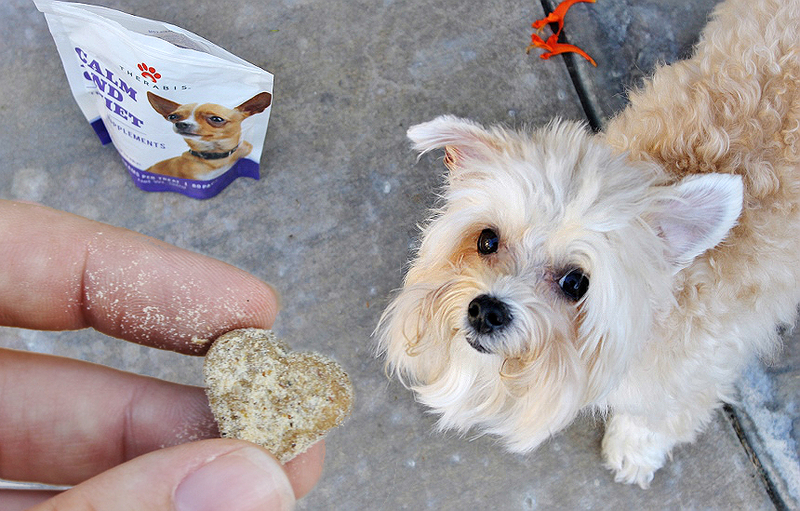 This post is sponsored by Therabis™ and the BlogPaws® Pet Influencer Network™. 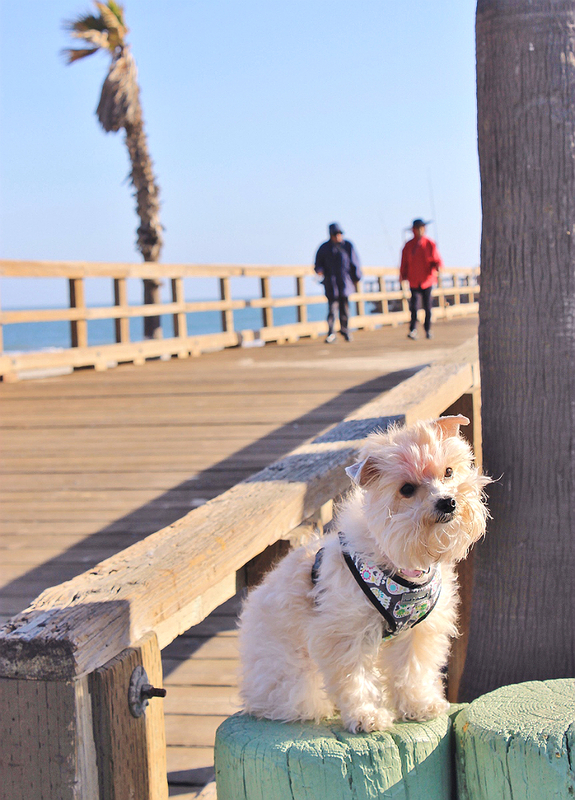 I am being compensated to help share information about Therabis - Hemp wellness products to help your dog with itching, anxiety and joint mobility. 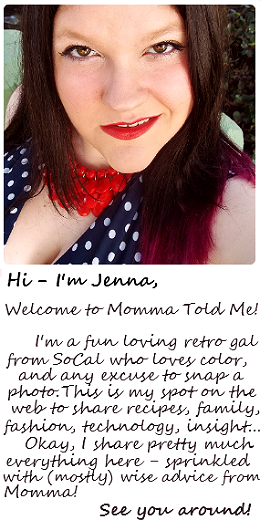 Momma Told Me only shares information we feel is relevant to our readers. 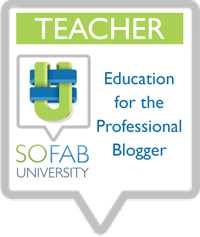 Therabis is not responsible for the content of this article. Nora has always been described as a high energy, fun loving, happy dog both by those who know her well, or simply have the pleasure of meeting her. We, okay I, like to joke that Nora would greet an axe murderer with a wagging tail and a silly smile- she simply never seemed to have any sense of negativity. 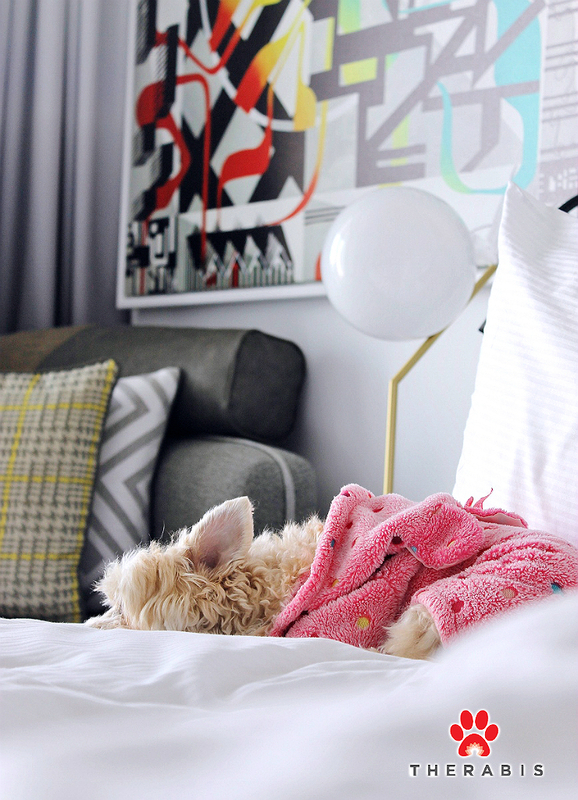 The exception being, like so many dogs, loud sudden noises such as fireworks- New Year's Eve and the 4th of July have long plagued the animals in our home with stress and anxiety. And every year it seems like the number of days people set off fireworks before and after the holidays themselves continues to grow, despite it being entirely illegal where we live. Because it was such a rare, twice a year, thing we never did much more to handle this stress within our pets outside of lots of cuddles and a good loud movie night. Then, last year, I was rear ended at a complete stop exiting the freeway and my car was totaled. Nora was inside- properly secured, and experienced no injuries- but she was fairly shaken up by the sheer sound and shock of the impact. 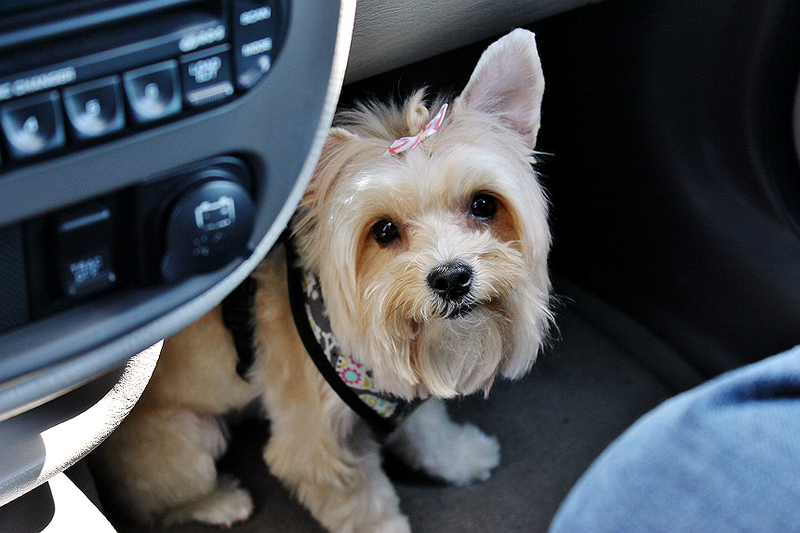 Suddenly my happy-go-lucky dog who loved to go for a ride any chance she could get was experiencing immense anxiety and signs of distress when she was forced to be in the car for even a short period of time. Above is a snapshot I took on my mobile phone as Nora and I set out to visit my father, a 5 mile drive across town, just a few weeks after the accident. It's hard to believe that photo is my Nora. Her rapid panting, ears back, and efforts to climb over the seat and into my lap were all clear signs that she was feeling anxious about her current situation. A perfectly happy, well loved, well cared for dog can experience signs of anxiety or stress from time to time. In Nora's case she began associating an event/location with a traumatic event and could no longer control her involuntary reactions to being placed back in a similar situation- despite the lack of actual threat. 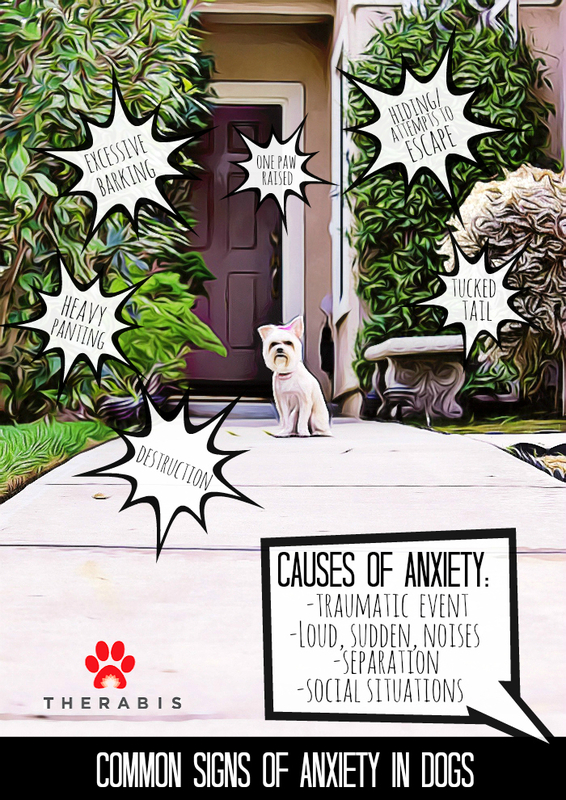 If your dog regularly responds to a situation with cues such as excessive barking, standing or sitting with one paw raised, ears back, whining or howling, or excessive panting and pacing your dog may be experiencing forms of anxiety or stress. The first, and most important thing to do is to identify what is going on, and where your dog is, when they are exhibiting these behaviors. In many cases there may be a simple solution of removing the dog from the stressful surroundings, or avoiding the situation. In some cases, such as separation anxiety, social stress, and fear of cars you may be unable to eliminate your dog's behavioral response by sheer avoidance. 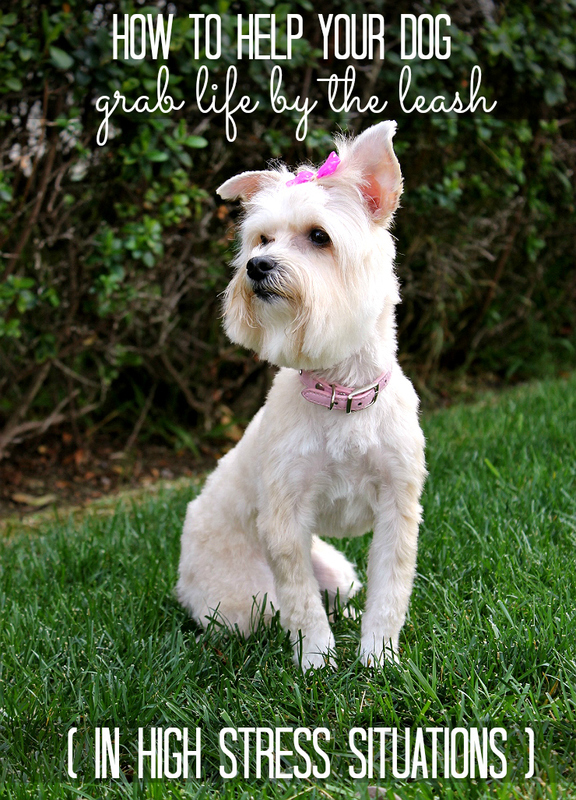 It can be frustrating when you see that your dog is not acting like themselves, and natural for you to want to fix whatever it is that is bothering your pet. The first, and most important thing, aside from identifying what is causing the anxiety, is patience and understanding. You may wish you could solve this with cuddles and a few comforting words but, unfortunately, dogs are conditioned with natural responses to situations, and cannot understand a threat has passed once they have experienced something traumatic enough to trigger a response behavior. The simplest remedy is time, and the rebuilding of safety through trust in similar situations. Nora, almost a year later, is much better in car rides and no longer breaks out in panting with signs of anxiety when we enter the car. However, there are still memories associated with the originating event in her mind. When our car goes over a pothole, or railroad tracks, it is as though she is experiencing a heightened sense of fear all over again. The painting starts, the ears go back, and she'll nervously attempt to hide. 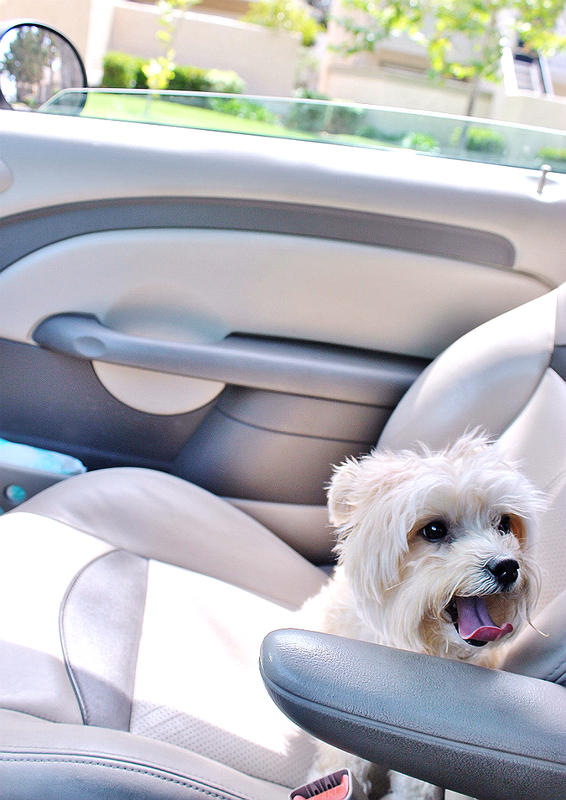 Where short car rides are relatively uneventful, and Nora happily emerges from the car her typical bubbly self, longer car rides can be quite rough on all involved- which is why I recently sought out the Therabis™ range of natural hemp oil derivative pet products. Therabis™, as a brand, is backed by 25 years of veterinary experience and over 10 years of research and development by founder and veterinarian Dr. Stephen M. Katz. Their hemp-wellness formulas harness the natural benefits of hemp extracted Cannabinoids(CBD) alongside other natural ingredients such as L-theanine (from green tea) and comprehensive vitamin compounds. 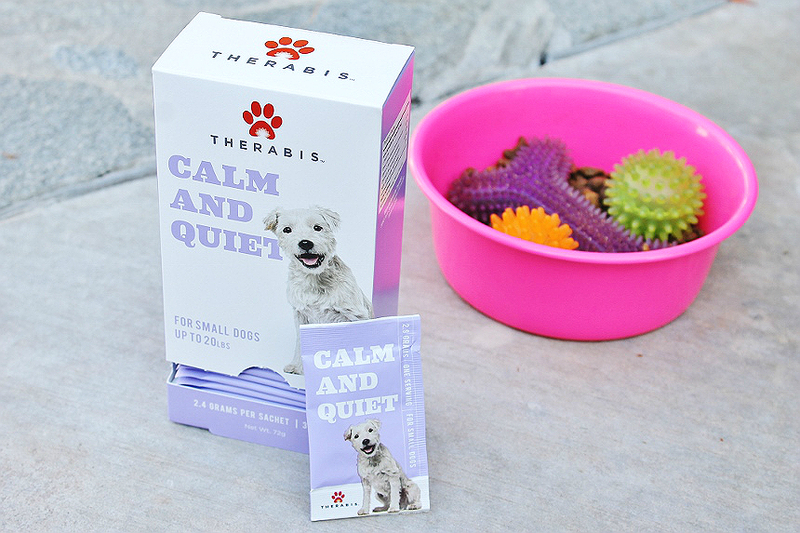 The CBDs obtained for Therabis™ pet products are sourced from industrial hemp that has been specifically cultivated to have minimal levels of THC so their natural therapeutic properties can be harnessed without producing any psychoactive effects. So what are Cannabinoids? They're a naturally occurring chemical compound found in hemp that interacts with your pets endocannabinoid system (the central regulatory system which impacts things such as mood, digestion, and sleep.) Your pet's body naturally produces it's own Cannabinoids which bind the the receptors of this endocannabinoid system, and Therabis™ should be considered a supplement used to help boost this systems natural impact. 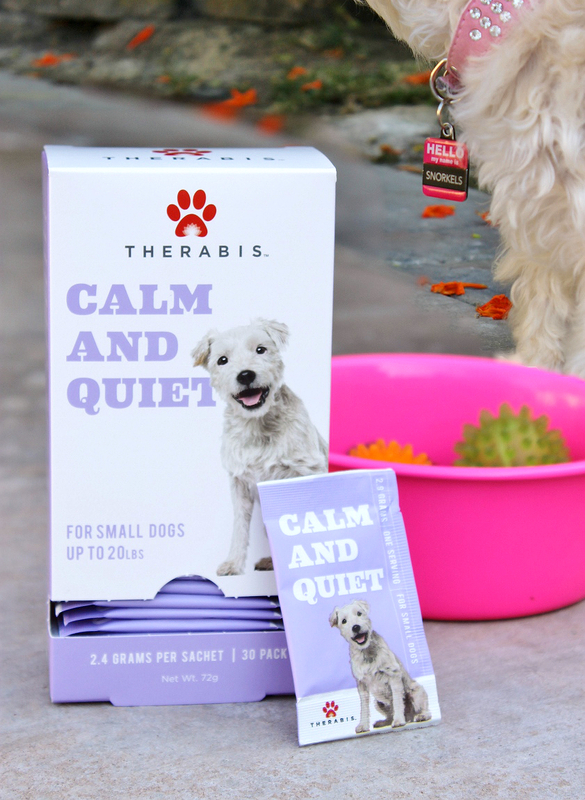 Therabis™ features multiple formulations to help ease and supplement your dog's unique set of challenges; Up And Moving (for ease of mobility and joint pain), Stop The Itch (for dogs with hot spots and excessive self grooming), and Calm And Quiet (for dogs who experience stress in situations or settings). After reading many experiences from actual Therabis™ Calm And Quiet users I was excited to be able to give it a try with Nora and her anxiety towards car rides. 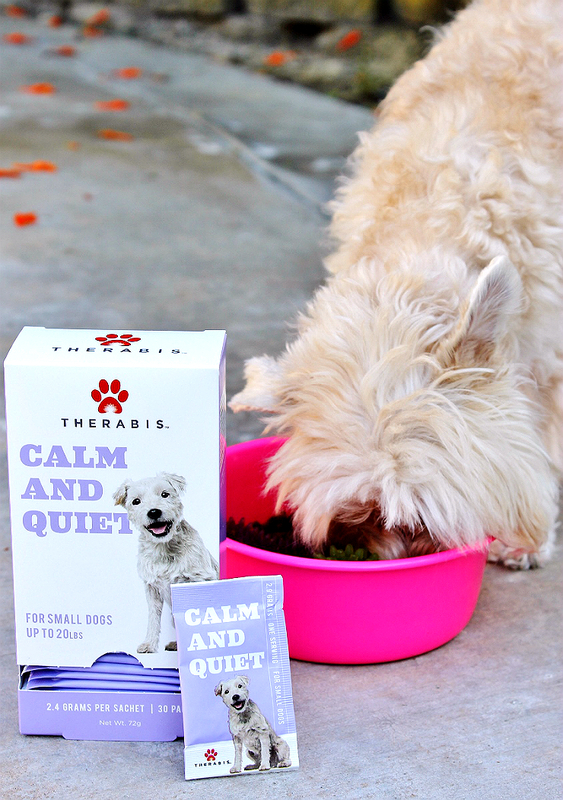 Therabis™ offers 2 formulations for their Calm And Quiet supplement, easy to take fast-acting treats- for on the spot treatment of stressful situations, and a daily Powder sachet intended to be sprinkled on a dog's primary meal each day. I was hesitant to start Nora with the daily powder supplement because I simply was unsure how she might react, and wondered what the impact would be throughout the day. The treats really appealed to me for an incident by incident bases of stressful car rides. However, I consulted with my Veterinarian and his insight was that an overall daily supplement, intended to help alleviate general stress, might be beneficial to work towards Nora's comfort with car rides in the long run. His theory was that she might naturally regain her confidence in the car if, over time, she continued to experience positive trips in them. Nora didn't seem to notice the Therabis Calm And Quiet powder sprinkled on her breakfast as she has eaten every such sprinkled bowl with equal enthusiasm to an everyday meal. 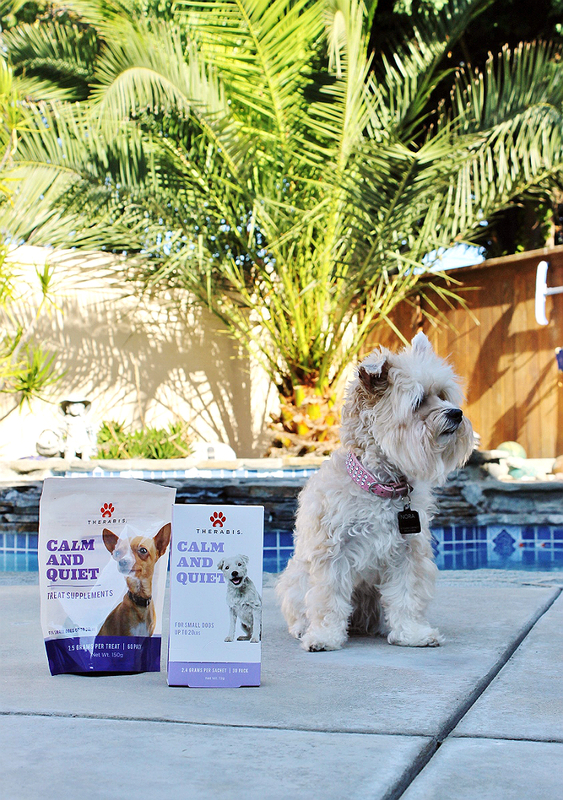 Because we have chosen to give Nora Calm And Quiet daily as a supplement to her everyday nutrition I feel the impact of this Therabis™ supplement has been immediate and dramatic. Jay kept joking that or dog would be 'out of it' and 'a different dog' but the truth is we have both been astonished by the positive change in Nora. She is just as much her usual active, bubbly, self around the house and out for walks- but we have successfully gone for multiple care rides now and she has yet to let out a single pant. 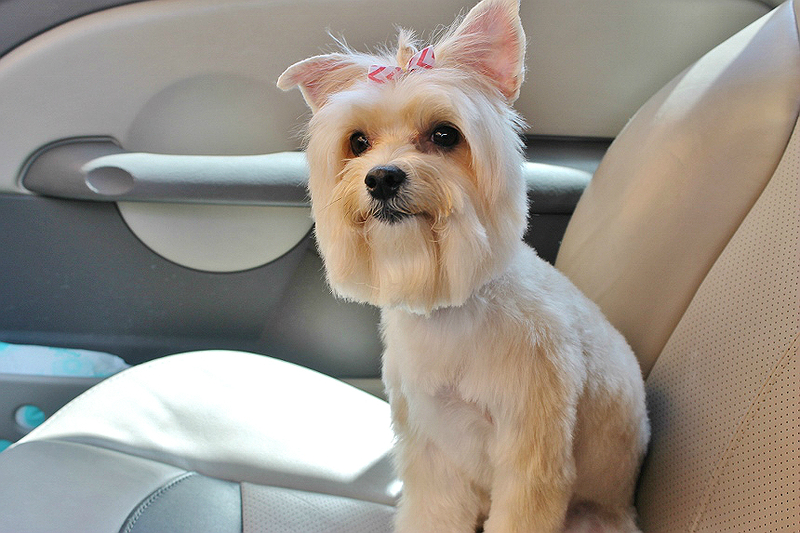 It is such a pleasure to see my dog's ears up in the car. Not only up, but Nora is very engaged and attentive. One might think Calm And Quiet would indicate a dog would be 'out of it' and sleeping all the time. We've found it to be the opposite- Nora is equally alert and, if anything, more discerning of the situation. 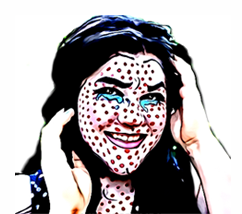 She seems to more rationally process information and react enthusiastically, but within reason. It's the Nora we know and love, just sharper and wiser- if that makes sense? I am over the moon to see her once again enjoying car rides, and have high expectations of Therabis™ Calm And Quiet for next year's New Year's Eve. There are several things that can seem to hold a dog back from being themselves. Sometimes we tend to attribute these things to age, or other circumstances outside our control. Unfortunately we can't sit our pets down and talk them through situations such as stress, itching, or sore joints, so it can be hard to know how to treat them. In most cases we simply want our 'old dog' back- that twinkle in their eyes when you come home, that silly smile as they run back with that fuzzy tennis ball. For a while, when Nora began showing signs of stress in the car we were forced to make the decision to leave her home on trips where she would have previously been our partner in crime. I am so glad to be able to grab the leash once again and get the whole family out and moving. 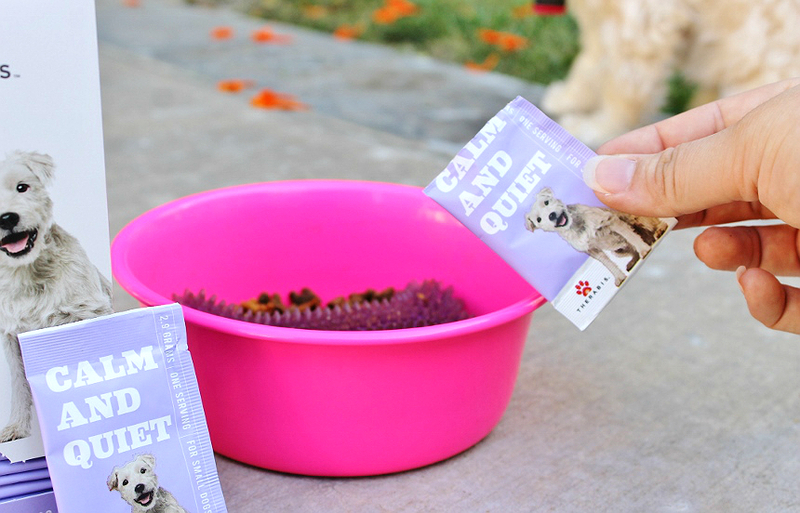 When a furry family member is experiencing something that alters the way they greet each day and live their lives that last thing one wants to do is change their dog's behavior further with treatments that can further slow a dog down. When it comes to a conditioned response to stressful stimuli and situations multiple forms of problem solving will benefit your dog on the road to becoming their 'good ol' selves'. Identify the problem and accept your dog's perception of the situation as stressful, limit the amount of time your pet has to put in similar situations until trust and confidence can be properly rebuilt, and seek the help of natural supplements to ease anxiety and allow your dog to embrace their everyday lifestyle once again. Learn more about Cannabinoids, and purchase Therabis™ pet supplement products online at Therabis.com. Do you have, or have you aver had, a pet who experienced anxiety during certain events? How did you handle it? I need to give Calm and Quiet a try. My dogs are generally laid back, but when the fireworks start, they absolutely flip. This sounds like great stuff. I love the idea of being able to help keep my dog calm without drugging him up. Seeing your fur friends stressed and anxious is so sad. 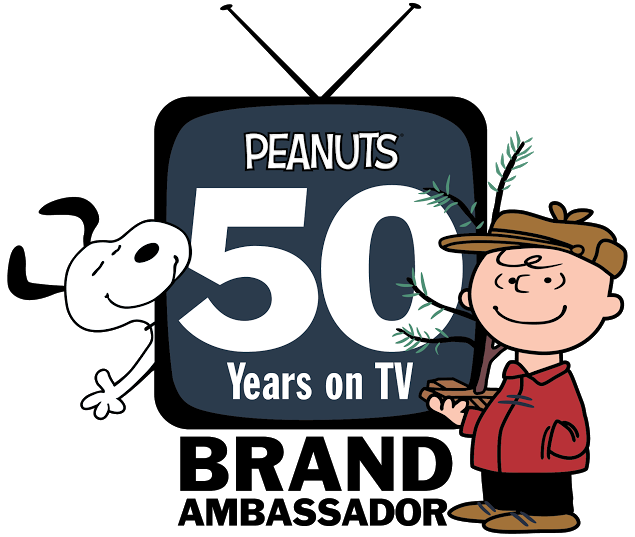 It's great that there is a product to help them relax in stressful situations like fireworks or unfamiliar surroundings. My dog has anxiety issues and I need something that will calm her down especially when there are fireworks. I cannot wait to try this. Our dog has recently started exhibiting signs of stress over some regular things. I will be looking at these in order to give him some comfort. I'm so happy you found something to help Nora with her anxiety issues! 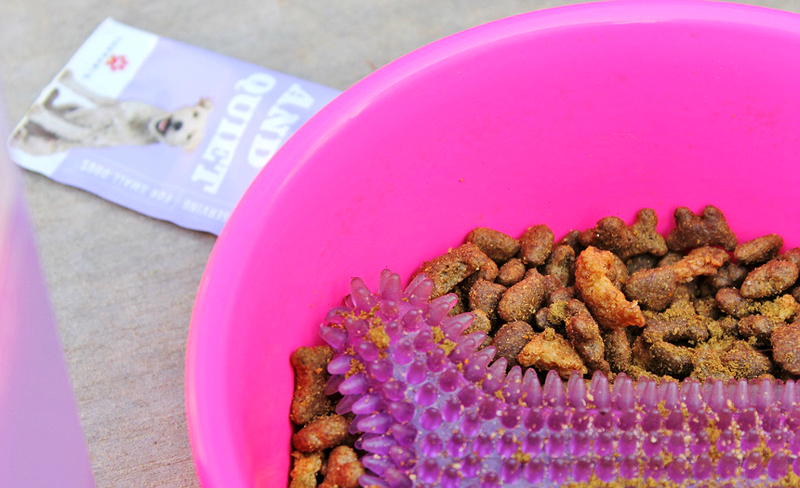 As pet owners we will do just about anything to make sure our furanimals are happy; which is why it makes me excited to see a product like this. It is such a great thing that you found something to help Nora with her stress and anxiety. These are fabulous tips. A lot of people have had such great success with Therabis!! Glad it's worked for you. - Shelby G.
My daughter has two dogs. They just moved into a new house. It was super stressful. I wish she had known about Therabis then! It's really nice that Therabis can have such positive effects on stress. I'd worry if my pets were feeling anxious all the time. Therabis sounds like a great product for my Dog. He gets so anxious when we have to go in the car. Fireworks are always a nightmare for my poor furbaby. My dog is currently experiencing major anxiety in her life. We just moved so she has no idea if she is coming to going. This sounds like a great product for dogs. I'm glad Nora has recovered from the accident and is able to enjoy car rides again. Our dog gets stressed out by all types of loud noises. I'll have to see about getting this for him. I so need to look in this! We have a pup that is always nervous over everything. I bet this would help! What a cute dog!! :D Thanks for sharing your tips here!! Very helpful! I know a few ppl who have dogs who could really use this. It's important to know when our dogs are scared and nervous! Our pets are very precious to us. But some times they suffer from joint pain. When my dog suffered from joint pain I gave him pet bounce a natural pain relief for dogs after some days he is fine.